Foam roller exercises can help you improve your body-mind connection. The muscles of the thigh are your instruments in the body metaphor of moving forward. I treat foam rolling as an intuitive process just like yoga. I emphasize the body-mind connection and the metaphysical reasons for why you hold your stress in certain muscle areas. For the best overview of the benefits of foam roller exercises, please go to my main page, called Foam Rolling. This article is where I fully explain the body-mind-soul effects. It also contains a comprehensive list of individual foam roller exercises for each body part. 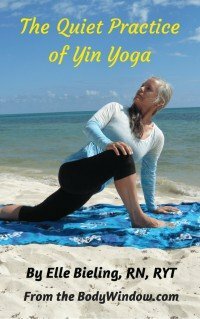 It is imperative you perform self-myofascial release techniques in the manner I describe to get the most optimal healing as you develop your intuition when you use the foam roller. Energy, stress or congestion that is brought about by strong emotions that you have not released, are stored in specific and metaphorical areas of our body. Foam roller exercises and stretches help us find this congestion to relieve it. If you need a roller for these foam roller exercises, or are thinking of upgrading your old one, I personally use the premium, textured roller type. This style has an added layer of cushion for comfort, that is nice for beginners who have not yet adjusted to this activity. They are textured for stickiness to your yoga mat, because the roller tend to move around a lot as you use them. If you wish for a more economical model, you can chose from a wide array of foam rollers available on the market. The muscles of the thigh are perhaps another group of muscles that are better known and a part of our every day vocabulary. The powerful thigh muscles are a vital part in walking, running, biking and every activity that utilizes the legs. The hamstrings, on the back of the thigh extend the leg at the hip and flex the knee. The muscle is actually a group of three muscles, the bicep femoris, the semitendinosis and the semimembrinosis and are the work horses in the extension of the leg. Any activity that requires sprinting or sudden bursts of leg movement involves the hamstring muscles. Sprinters in such sports such as track and field, soccer, football, basketball and the like are often sufferers of hamstring injury. Beware if you are a weekend warrior that plays sprinting sports. Also beware if you are a new martial artist and new to kicking movements. Also keep in mind that any force that suddenly extends the legs or overextends at the knee may cause hamstring pulls. People over the age of 65 and whose primary activity involves walking are also at risk. So are growing children. Over-strengthening of the quadriceps muscles in the front of the leg that causes an imbalance in relation to the hamstring muscles. Poor conditioning that results in muscle fatigue or one leg stronger than another. In my opinion, the best hamstring exercises are those that combine flexibility and stretching, like one does in yoga poses. I am fond of calling yoga poses strengthening stretches. I accomplish stretching and strengthening with yoga. The quadriceps muscles in the front of your thigh flexes your leg at the hip and extends your knee. The quadriceps muscles are the ones that give the thigh the beautifully developed shapeliness that body builders, athletes and just about everyone loves. Because of this, and because the quadriceps muscles are naturally stronger than the hamstring muscles, over development of the quads may lead to tight hamstring muscles. The quadriceps muscles are actually a group of four muscles, the vastus medialis, the vastus intermedius, the vastus lateralis and the rectus femoris. The quadriceps muscles are used in conjunction with the hamstring muscles and the causes of their injuries are essentially the same as in the hamstring muscles, so please see the above list. If you have a mild strain in the hamstring muscles or quadriceps muscles, you can try the RICE procedures at home: Rest, Ice, Compression and Elevation. You should wait to perform these foam roller exercises until the pain is almost gone, or you could re-injure your muscles. If your muscle strain does not improve in a few days with this self-treatment, you may want to consult an expert. For men, the muscles of the thigh may represent powering yourself forward in a forceful manner, as your legs are much stronger than a woman’s. If men are physically active it is easy for the quadriceps muscles to overpower the hamstring muscles and become tight. The quadriceps muscles may become sore and be full of congestion if the mind’s biggest goal is to power forward in life and into the future. If you are driven, your issues may be manifested in the thigh muscles. Often the powering forward is in a manner that is rigid and not supportive of the rest of the leg, especially the knee. The hamstring muscles and the quadriceps muscles in conjunction with one another largely control flexibility at the knee and the knees may become sore if the quads try to over power the leg. Overuse of the leg in any activity may cause sore knees. Knees classically represent flexibility and the ability to bend and flex. If your knees are rigid and sore, it is suggested that you are rigid and inflexible as well. I am more of a driven, goal-oriented person, and my quadriceps muscles are often sore at the head of the vastus medialis on the inner part of the knee. My sartorius muscle (also in the front of the thigh) is also involved in the inner aspect of the knee. I suppose that makes me inflexible as well! In the foam roller exercises video I show you how to ensure that you hit this area when foam rolling the quadriceps muscles. Some days it is all I can do to love myself and love my energy when I overuse my forward moving power and my inner knees get sore! I have often been told that I walk with determination. Is it any wonder that this emotion is manifested in my legs? Is my impatience speaking through my Body Window?? When you practice your own foam roller exercises for your hamstring muscles and quadriceps muscles, meditate on the meaning of these sore areas in your life and what it may represent for you. I am flexible in all things in my life. I bend and flow with ease. I trust the process of life and embrace the future with hope. I release control to God/the Universe. I move forward with trust and faith. My legs are supple and flexible. I release my fear of the future and take it one small step a time. I believe in my ideas for the future. I believe that abundance and happiness are my reality. I create the time for things that have meaning in my life. I move at the speed of the Universe, waiting for those things that stir my own heart. When foam rolling your hamstrings and quadriceps and when doing the stretches too, try to reflect on what this tissue area may represent in your life, and if you feel you may be holding emotions here that need releasing. Meditate on whether you might have issues regarding moving forward. Does this bring you fear, or do you power yourself forward too forcefully, ‘jumping ahead of yourself?’ Meditate on whether you have issues of over-extension of yourself, or if you are inflexible and rigid. Use the time to ‘kick around’ new ideas and new ways of thinking to love and trust yourself! Journal about your feelings as you reflect on your hamstring muscles, your quadriceps muscles and your knees. My instructions for the foam roller exercises are a starting point only for your own personal foam roller exercises. Spend time with the movements, intuitively moving where your muscle needs it. Shift your weight up or down, or left and right to find the sore areas. Spend more time in one area if needed, if it is more sore. Vary the pressure by sinking your weight deeper as needed. When you find a sore area, your automatic response to the pain is to hold your breath. Try not to, but instead back off on the pressure so you can continue to deeply breathe once again. If you hold your breath, the muscle will tense up more. This is the opposite effect that you are trying to achieve. 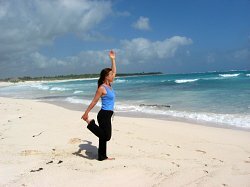 By continuing to deeply breathe, you are signalling to your body and your brain that you are relaxed. Eventually the muscle will release as long as you are able to deep breathe. It may take 30 seconds of pressure and deep breathing for the muscle to release. Or it may take several days of effort to learn the process. But don't give up trying! Go slowly if you are new to foam roller exercises. If you roll too vigorously, you may find bruises the next day. Pay attention to your body sensations as you practice the foam roller exercises. Continue to breathe deeply and move into the pain, the sore and tight areas. Feel the pull, the stretch, the discomfort as you tell the muscles that they may let go. Breathe deeper and sink into the muscle, let the tension and stress go. Let the feeling of release come, in your body, mind and soul! The feeling of release when you learn this process is very addicting. The physical release alone is worth while and the emotional release, if it occurs is even better. For the hamstring muscles, sit on the foam roller with the roller under the back of your thighs and your arms behind you with your hands on the floor for support. Pushing off with your hands, roll down the upper part of the back of the leg just to the knee and back up. If you wish, when you do this foam roller exercises, cross one leg over the other at the ankle to increase the pressure on one side. I have not depicted this cross over in the video for the hamstring muscle rolling because it requires a lot of skill and balance and a lot of abdominal strength. My intuition does not lead me to this exercise for myself, but if you are up for it and feel you need to apply more pressure to the hamstring muscles, go ahead and try it! For the quadriceps muscles, lie on the foam roller with the roller under the front of the top of thighs. Place your arms under your upper body, like you were going to do a push-up, with your hands on the floor. Push off with your arms to roll down the upper leg just to the knee, and back. Do not roll over the knee joints. To increase the pressure on one side, cross your one leg over the other at the ankle and foam roll only the quadriceps muscles on the bottom leg. This increases the pressure nicely and is not as hard to do as with the hamstring muscles. To get the inside of the quadriceps muscles at the vastus medialis head, bend your right knee and place your right foot on your left ankle. This position looks like Peter Pan flying through the air! Push off with your hands and roll down the inside of the quadriceps muscles, taking care not to roll over the knee, but targeting the bottom, inside head of the vastus medialis. As always, to increase the pressure and the stretch, sink harder with your weight into the foam roller. You may vary the foam roller exercises in any way as your intuition moves you! I have added another short video to show you how to foam roll the vastus medialis head of the quadriceps. I have trouble with the inside of my knees, and I can manage the knee pain with this exercise. It also targets the sartorius and to a lesser extent the adductors. Lay on the floor, parallel to the foam roller. Bend up your right knee and and rest it inside of the thigh, just above the knee on the foam roller. Keep your leg bent. Place most of your weight on your left elbow, that will be the leverage point for the movement. Roll up and down the vastus medialis muscle. If you lean your body weight toward the inner and upper part of the knee, you can target the vastus medialis instead of the adductors (groin muscles). Straighten the leg, so it is almost perpendicular to your body, to deepen the stretch. You may chose to follow up with hamstring stretches by doing these yoga stretches. I love the Downward Dog for hamstring stretching. I also love the Standing Forward Bend, for a standing hamstring stretch and the Seated Forward Bend, for a seated hamstring stretch. For quadricep stretches you can do yoga stretches like the Dancer's Pose and the Pigeon Pose below. Really pull up on the back leg for the quad stretch. Foam rolling and yoga stretches are wonderful tools to help you learn how to create space in your body. When you are able to free the tension in your body, your mind and soul will be able to create positive energy to move into your life! May your path to discovering yourself be enhanced by these foam roller exercises, hamstring stretches and quadricep stretches and may your never cease to journey towards body-mind-soul healing. May you always 'jump for joy' as you use you thigh muscles!